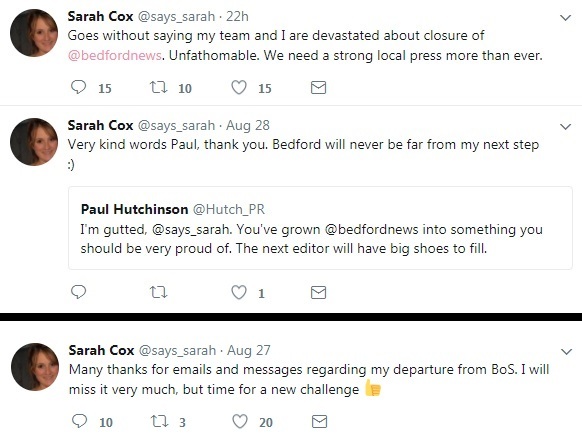 Sarah Cox, left, says she and staff at Bedfordshire on Sunday are “devastated” at Trinity Mirror’s announcement, which will also see three weekly titles in Cambridgeshire and Suffolk close. 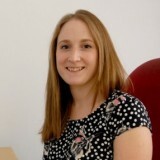 TM declined to confirm the number of jobs affected by the changes when approached by HTFP, but Sarah has confirmed she is stepping down from her role after three years. Trinity Mirror is currently recruiting two community content creators to join a team putting together the new title, which it is provisionally calling ‘Bedfordshire Midweek’. The publication date switch, which will also coincide with the closure of the Bedfordshire on Sunday website, is set to take place in early October. The newspaper was originally founded in 1977 by Frank Branston, who went on to become the Mayor of Bedford. On his election to the role, Mr Branston sold the paper along with its stablemate Luton on Sunday to Iliffe News and Media, which was later merged into Local World. It became part of Trinity Mirror following the group’s takeover of Local World in 2015. TM has announced that the Ely News, Haverhill News and Newmarket News – which are run as part of the daily Cambridge News’s operation – will also close at the end of September. Simon Edgley, Trinity Mirror’s regional managing director for the South East and Central & East, has previously said. “These decisions are never easy to make but they are necessary if we are to maintain a viable commercial operation with the opportunity to invest in the growth of our remaining news brands. Finally an editor honest enough to tell it how it is. Devastating. Really! They are going to name it after a failed project that Illiffe already tried in 2012. Why in this industry do we always have people at the top with no clue who can never look at the past. I’m sure a few of you out there recognise the cycle of the same failed ideas over and over again so they can look like they know what they’re doing. As far as I’m being told this highly regarded paper was doing ok still so why kill it with this stupidity!?! Tell you what, it’s bloody refreshing to hear a departing editor be so frank and honest about the situation. Just for the record, sacked editors tend not to speak out due to the financial gun held to their head. It’s a gagging clause which Trinity Mirror would be stupid to enforce – but you wouldn’t want to risk your redundo to test the theory.